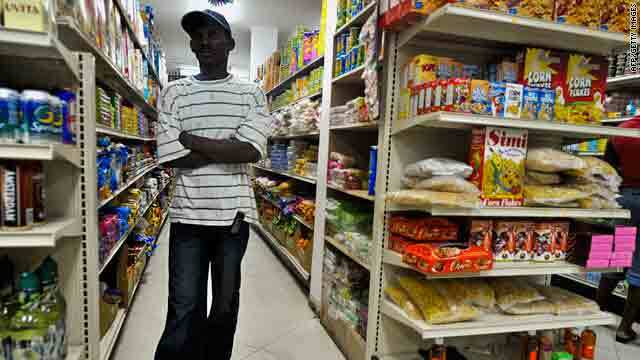 Some small grocery stores are starting to reopen in Port-au-Prince. This man looks for necessities Thursday. Port-au-Prince, Haiti (CNN) -- Long truck convoys inched their way through heavy traffic in Haiti's capital Thursday, bringing relief efforts into full view in parts of Port-au-Prince. A 40-vehicle convoy that seemed to be coming from the neighboring Dominican Republic headed into town Thursday afternoon on the Route Nationale in western Port-au-Prince. Escorted by heavily armed United Nations troops, the convoy had more than two dozen tractor-trailers, in addition to water and fuel tankers and even an armored car toward the back of the caravan. Some of the trucks carried the insignia of the Catholic Relief Services organization, while other vehicles bore markings identifying them as being from the Dominican Republic. Other aid and military vehicles traveled elsewhere in western Port-au-Prince, particularly on Boulevards T. L'Ouverture and 15 de Octobre. Residents as well as caregivers had complained earlier this week that aid was not getting out quickly enough. For the second day in a row, the city gave indications of coming back to life. The sidewalks were crowded with street vendors and kiosks, and many small food stores were open. Dozens of stalls at a dusty market sold fruits and vegetables along a pocked and rut-filled dirt side street. A smaller market on a street corner saw some business. On the Route Nationale, residents crowded around the back of a parked brown semi-tractor trailer for hours before the back doors opened and local aid workers handed each person a six-pack of bottled water. The throng seemed relatively orderly, and no commotion was noticed. Long lines formed in front of some of the city's money-transfer offices, which opened for the first time since the January 12 quake that shattered large parts of Port-au-Prince. Haitians in line were there to pick up money sent to them from elsewhere, mainly the United States. Streets were choked with tap-taps, the brightly painted small pickup trucks that have been converted into passenger minibuses, with 10 or 12 people sitting on two facing benches on the truck bed. Many tap-taps carry Christian inspirations such as "Jesus saves" on their windshields and have intricate designs and messages on the side walls. Haitian police and U.N. military vehicles were common, and local authorities seemed to take an increased posture. Five national police officers, easily identified by their camouflage uniforms, jumped out of their truck at an intersection in the Cite de Soleil neighborhood near the harbor. They investigated men at the rear of two small pickups stopped there. One officer dropped to his right knee and briefly pointed his rifle toward the men. He and the other officers then abruptly turned around and walked away a few seconds later. Cite de Soleil is the poorest and roughest neighborhood in the city, known more for its rampant crime and violence than its poetic-sounding name. Like all other parts of Port-au-Prince, many residents say it has fallen into increasing disrepair since the 1980s. A nearby neighborhood, Carrefour, was once a tourist destination but has become a run-down, lower-class neighborhood.